There are two main reasons I think it’s advertising rather than journalism. First, the subject of the article pays to have the article written. That’s not journalism. Second, the subject of the article has full editorial control over the final product. That’s not journalism. The main reasons I think they are trying to pass as journalism are that they call themselves a magazine and that there’s nothing in the articles to suggest that they were commissioned by their subjects. I don’t think they liked what I wrote, because their Editorial Director emailed that she was “interested and concerned” about my comments and would like to talk on the phone. I replied that I would prefer to communicate by email, and I haven’t heard from them since (see “If you really want me to not trust you (a rant)“). For this service, the researcher pays a good bit of money: $2230 is what was quoted to me, or about the cost of publishing in a good open access journal. To be fair, the resulting articles ARE open access, published under a Creative Commons license and free to read on the Research Features website. It turns out that very little of that money goes to the author of the article. A reader of the blog sent me a copy of Research Features‘ Freelance Science Writer Contract, which specifies a payment of £50, around $67.50 at today’s exchange rate. That’s about 3% of what the researcher pays for the article. I’m sure Research Features has some substantial expenses. That slick layout doesn’t come for free. Their editorial staff surely puts some time into each article. There are costs associated with maintaining their website, a social media presence, and (I’m sure) all kinds of things I’m not thinking of. Still, $67.50 doesn’t seem like much money. The articles run 900-1000 words plus “a set of 5 Q&A questions for the client to answer” (and BTW, journalists have subjects, not clients). From what I’ve seen, they’re well-written. I’ve tried to imagine how long it would take me to write something like that. Unless the subject (client) was doing research squarely in my tiny wheelhouse–say evolution of multicellularity—I’d need to read some of their work, probably a grant proposal and/or some published papers. I’d need to write something that is understandable by people outside of the field, but still accurate and detailed. There would no doubt be revisions requested by the client, maybe more than one round. If I were totally focused and the research were broadly within my field–say evolutionary biology–I can’t imagine getting it done in less than three days. For $67.50. 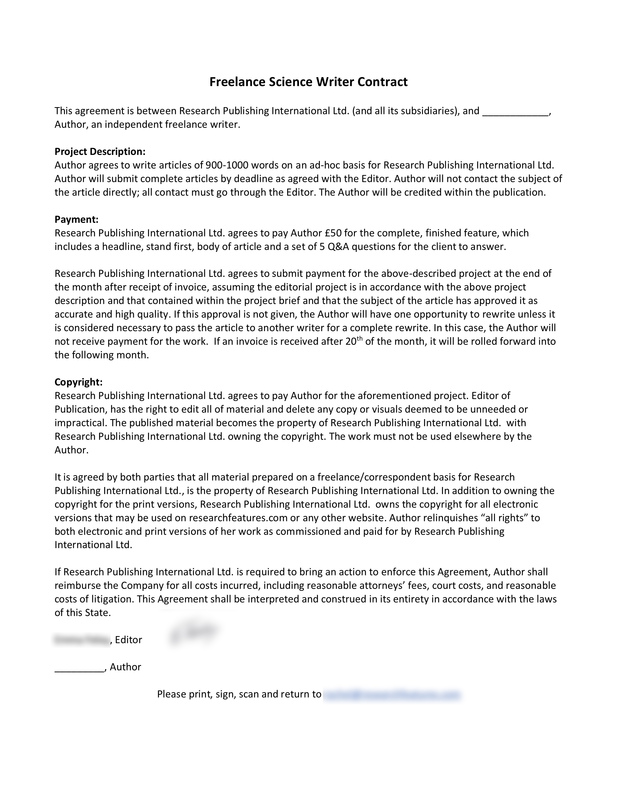 Research Publishing International Ltd. agrees to submit payment for the above-described project at the end of the month after receipt of invoice, assuming the editorial project is in accordance with the above project description and that contained within the project brief and that the subject of the article has approved it as accurate and high quality. If this approval is not given, the Author will have one opportunity to rewrite unless it is considered necessary to pass the article to another writer for a complete rewrite. In this case, the Author will not receive payment for the work. The Author will be credited within the publication. I would love to know more about this. If you’ve written for Research Features, please feel free to leave a comment or contact me by email. How was your experience? Did you feel that you were fairly compensated? Any idea why they don’t want authors associated with particular articles? This is true. I would write for RF for only 50 pounds. Then I saw how much they charged scientists to be featured and realised it was unethical. I was also shocked at how much scientists paid to be published in regular peer reviewed journals. So I started my own digital magazine, there to support scientists and artists, called NatureVolve.com Thanks for sharing this post, it is validating to see others shared the same concern. Many companies are monetizing on open access but some more for money than freedom of knowledge.